Low maintenance, energy efficiency and ease of installation are just some of the benefits you find in the Series 7450 New Construction Awning Window. Hinged at the top, it opens outward from the bottom, providing excellent ventilation while protecting you from the weather. Unique designs can be achieved by stacking multiple awning windows in columns or grouping them together to create a row or wall of light. 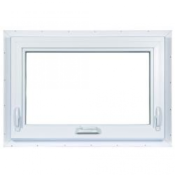 A continuous, one-piece frame for twin and triple window combinations provides a clean look, easy handling and trouble-free installation. Please E-mail us for a shipping quote.